How do you encourage young people in Northeast Wisconsin to step up and be innovators, leaders and creative artists? Can we show them the untapped talents they already possess? Is there a way to empower students with the confidence they need to take risks, solve problems and see a project through from idea to completion? That’s the goal of a brand new film festival taking place in our area this November. The Downtown Green Bay Kiwanis club is spearheading the Sconniewood Youth Film Festival. It’s a special project that falls right in line with the mission of the Kiwanis – which is building a better community by supporting schools, families, youth programs and other local organizations. But this time the Kiwanis Club of Green Bay – Downtown is going beyond providing support and taking matters into their own hands. Northeast Wisconsin is already home to some exceptional film fests. That includes the Wildwood Film Festival in Appleton, a Door County Short Film Fest, and the Green Bay Film Festival, which draws in productions from filmmakers around the country and the world. The Sconniewood Film Festival is unique. It puts the spotlight on young creative minds right here at home. WhooNEW spoke with Green Bay Kiwanis Club President, Joe Jacques, about the new festival. He says the ultimate goal of the event is to give students a platform to express themselves. The club also expects this film festival to become a tradition that gets carried on for years to come. Jacques is referring to the Kiwanis Teen Film Festival in Idaho Falls. That event is helping turn a region known for not much more than potatoes into a place for emerging filmmakers to learn and grow. Could the same thing happen here in Wisconsin? Kids are growing up in a world that is far different from that of their parents – we have technology to thank. Making your own movie used to mean purchasing expensive equipment and software. Even then it was difficult for amateur filmmakers – especially students younger than college age – to find a way to put their projects in front of an audience. But today – just about every person carries a mini movie-making tool in their pocket. Smartphones shoot high-definition video and even come with editing capabilities. In addition, many families have access to DSLR cameras that also shoot quality video. You can download free video editing software and find a wealth of information online that teaches you how to shoot and edit video like a pro. The Sconniewood website provides a long list of these free resources. Let’s not forget – sites like YouTube allow anyone to showcase their work in front of the entire world. The biggest difference between now and 20 years ago is that you no longer need to hope someone else tells you your ideas are good enough. You don’t have to wait to get picked by studio executives, publishers, art critics or investors. Instead – all you need to do is pick yourself. Make your idea come to life, then find an audience and let them decide. The internet has evolved into an incredible opportunity for any person on the planet. But we have a choice…young and old alike. We can settle for being nothing but consumers of online content, or we can seize the day and view the internet for what it truly is – an amazing digital canvas for all sorts of art and innovation. Sconniewood will show students how to do more than use technology as yet another way to consume. It turns them into creators. The Kiwanis Club of Green Bay – Downtown realizes this film festival is about much more than a chance for kids to have fun making movies and potentially win some prizes. There are many valuable lessons to be gained from putting together a film. Students who participate in this event will learn about project management. Producing a video isn’t easy. You almost always need to get others involved if you want to make your dream a reality. You need to make decisions, solve problems and effectively communicate a specific concept. Students will learn leadership development in addition to creativity. Making a film requires teamwork, technical knowledge, design, writing and acting abilities. And when you’re learning skills like those while making your own movie – it seems like play – not homework. Movie-making is communication at its finest because it is communication through advanced storytelling. Consider this. The Department of Defense recently invested millions of dollars researching the impact narrative storytelling can have on the outcomes of military security situations. You can read more about it on sites like Wired Magazine and The New York Times. If storytelling is that powerful of a tool – we’d be doing our youth a great disservice by failing to help develop a skill that can advance their future careers. The Kiwanis Club of Green Bay – Downtown is making things easy for young filmmakers. Unlike typical film fests, Sconniewood charges no entrance fee for film submissions. Students can use whatever music, images or other media they have on hand in their projects. Best of all – a festival like this instills confidence in the youth of our community. It rewards them for stepping up and doing something special. Jacques says encouraging participation is the focus of the inaugural event. The Kiwanis enlisted the help of Key Clubs they sponsor at Green Bay’s Preble and Southwest high schools with Bay Port to be included in the near future. But the assistance and guidance of adults in our community is also needed. If you are an educator, a parent, or anyone who cares about kids, original art and creative self-expression – this is your chance to make a difference. So encourage participation and help these young people out. If you have experience with any aspect of filmmaking, you are more than welcome to mentor and teach them what you know. Get your family together, brainstorm an idea and discover the joy of making something together. Joe Jacques says, first and foremost, the event needs submissions to be successful. But even if you are unable to participate in that way, attending the upcoming film festival and spreading the word is still extremely helpful. The Meyer Theatre in Green Bay can hold around 1,000 people and organizers hope to sell the place out. 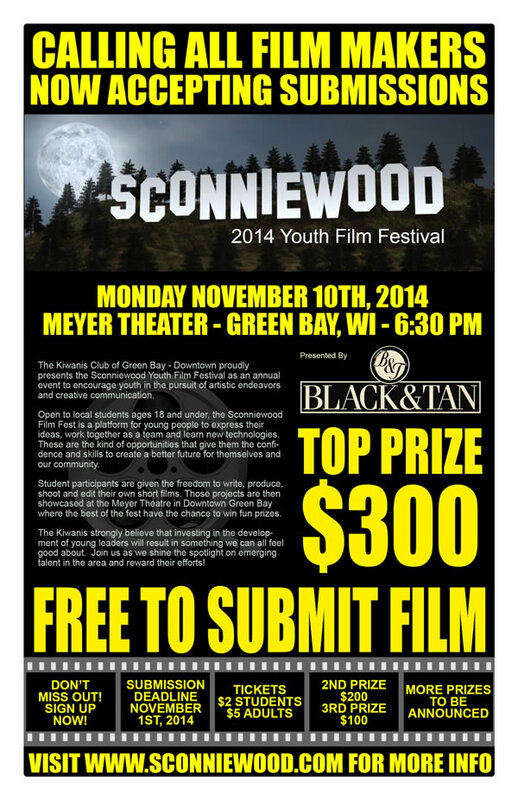 The main sponsor for the Sconniewood Youth Film Festival is Black & Tan Grille in Green Bay. The restaurant put up $600 in prize money with $300 going to first place, $200 for second and $1o0 for the third place film. This festival is intended for short films involving students in elementary, middle school, junior high and high school in the Greater Green Bay Area. Films should be a maximum of approximately 10 minutes in length. The deadline for submitting a film is November 1st by midnight. Submissions can be made using DropBox or Google Drive. Participants are allowed to submit new and/or existing video projects that fit within the festivals rules and guidelines. Appropriate subject matter of all kinds will be considered. A selection of potential themes suggesting concepts that promote positive ideas are listed on the festival’s website. However, students of all ages and their families are encouraged to get creative. It doesn’t have to be a masterpiece. Kids may want to experiment with new types of filmmaking like machinima, which uses video games to tell a story, or stop motion films using Legos and other toys. Check out one of the film fest submission below featuring a kid who came up with an imaginative way to pull out his loose tooth. This will be a fun, family-friendly evening for all ages. Watch the creative talents of young people in our community displayed on a big screen in a beautiful venue. You’ll be encouraging them to keep experimenting, creating and leading. Remember – famous filmmakers from Wisconsin include Orson Welles, the Zucker Brothers, Howard Hawks and many more. How cool would it be to say you saw the next Steven Spielberg’s first film right here in Green Bay? You never know! Help Spread the Word About this Event! Share this story on Facebook or your favorite social network using the buttons below – especially if you know young people who are aspiring movie-makers. Image Credit – Kid with iPhone Courtesy: ereyesleblanc via Flickr. I love the idea of this. Also, a great name for the fest!